Discussion in 'The Lounge' started by douglas, Aug 28, 2005. Start / Pro Female XC. Good pictures, but they are a little blurry. Nice work Tigg and douglas!!! congrats on the podium, now let me give you a little lesson in this thing I call "focus"
F'n cool dude. All these NY riders podiuming. Hmmm glad to see racing isn't dead in the empire state. Way to represent Doug and Tigg! So, if you didn't get my message, I did not get your PMs until today. I wrecked pretty hard in Thursday practice on the rocks up top on my 4th run. I bruised my knee and hand really badly along with cutting up my shoulder and arm and trashing my front wheel. I really have no idea what happened...just one of those "riding....riding...and that's the sound of my helmet bouncing on the rocks" crashes. I stayed with an ex-girlfriend and her family in Rochester, VT on Thursday and was planning to camp at Haystack the rest of the time. Well, I got up Fri and Sat and both times it was painful to walk and I could not bend my right middle finger at all (physically could not move it because of the swelling). So, without being able to pedal or hold the bars, I stayed in Rochester until this morning when I left to watch the rest of the races. Congrats Doug & Tigg!!! Sorry to hear about your crash James! Hope you heal up quick!!! awesome job guys.. way to represent the monkey !!!!!! Awesome work, boys!!! Two monkey podiums! HOORAY! While Tigg & I watched the expert DH, both his buddy and mine fell hard right in front of us.......I was suprised they could get even get back up, but they both finished there runs. My friend was brought to the medical area, looked like he needed a few stiches to his forehead. ... now let me give you a little lesson in this thing I call "focus"
Are XC results posted anywhere? I found out Saturday morning that my cousin raced...probably beginner category. That was one tough XC course, had to be over 1000 ft of climbing, and no time to rest (except a 1/4 mile flat section around a pond), pretty much you were either climbing, or descending on really demanding technical singletrack. Way to represent with the RM Jersey on the podium DOUG! BTW, the pics are blurry, but thats because you are viewing it sober. Have a couple of beers and they clear RIGHT UP!!! i havent been up there in quite a few years. i love runinng mount snow. 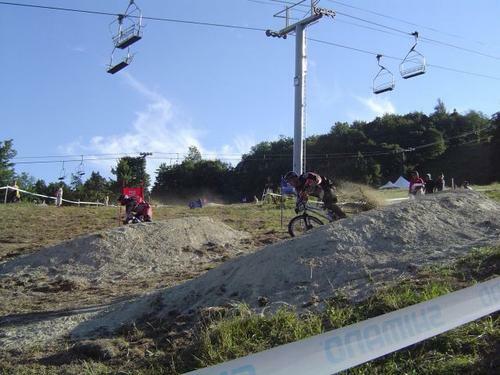 the last time i was up there was probably 1998 or 99. we were riding the trails the weekend before the race and they were setting everything up. one of the dudes i was with was not much of a biker and he crashed and burned hard on teh first run only 30 yards from the top of the lift. as much as we warned him that this was not just a ride through the woods, he insisted on going with us. well to make a long story short, he had to walk down the hill with a busted wrist and sat on the picnic tables watching the NORBA guys set up shop.